Is that a Microbus? Nope -- it's VW's new BUDD-e concept. Look out Tesla -- Volkswagen is going electric. 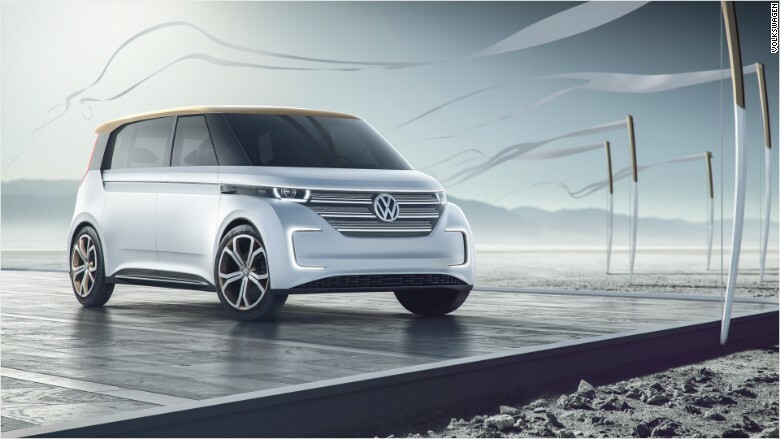 Volkswagen brand chief Herbert Diess introduced two new concept electric vehicles Tuesday night at the 2016 Consumer Electronics Show: the e-Golf Touch and the BUDD-e. The BUDD-e, a concept car that recalls the iconic VW Microbus, stole the show. The vehicle is fully electric, and has an estimated range of 233 miles (compared to Tesla Model X's 257 mile range). It charges to 80% capacity in 30 minutes thanks to a new electric vehicle architecture. "We are doing more than just putting electric power trains in our conventional models," Diess said. "We are developing entirely new and unique vehicle concepts, especially for long-distance electric mobility." The BUDD-e's battery lies flat on the vehicle's floor, similar to the Tesla Model S, which allows for new design and proportions. And it's certainly hi-tech. The BUDD-e's doors open with a voice command, and the vehicle's cockpit, composed of several screens instead of gauges, has what Diess described as an "intuitive" dashboard. Not only does the dashboard control apps inside the vehicle, but it can also inform the driver about things happening in their home -- such as what's in the refrigerator. Diess said the BUDD-e could be a reality by the end of the decade. As for the e-Golf Touch concept, Volkswagen said it was fully electric, but didn't provide details on how many miles per charge it received. Instead, presenters showcased a user interface that relies on voice commands and gestures instead of buttons. The e-Golf Touch also features a wireless smartphone charging system, a speed warning that alerts owners if a car has traveled too fast and a "where's my car" function that will help locate the vehicle. Diess also addressed the emissions scandal that has plagued the company for months. "The current issue with the diesel engines is certainly nothing to be proud of," he said. "We disappointed our customers and the American people, for which ... I'm truly sorry and for which I apologize."